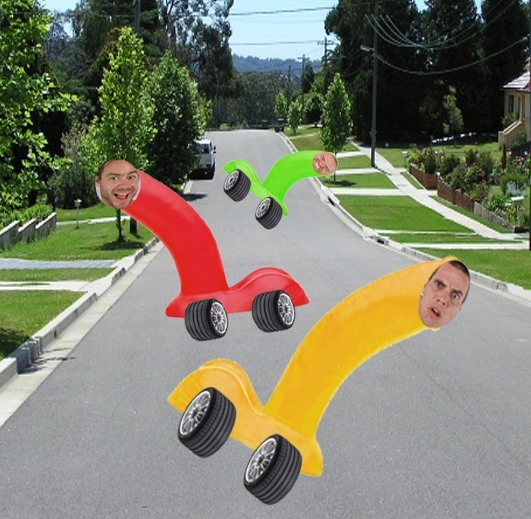 Each of the Jackass cast members are encased in different colored Jell-O molds the shape of life size penises on wheels. They whiz down the hill in an unsuspecting suburban neighborhood, flabbergasting and horrifying onlookers. The flying phalluses meet their sweet, sticky demise somewhere along the way in epic 3D splats! Incredible idea. This is a dream in 3-D! Step up Jackass crew and so this stunt! This has WINNER written all over it. Step it up Jackass crew and get into your Jello Molds. Seeing that coming down the street would be very memorable. Its a PRANK contest. Try stippin it up.